Look, We've Come Through was the lovely title of a Hugh Wheeler play from the early 1960s which TrustMovies couldn't help but think of (the title, not the play itself), after viewing the new documentary HOW TO SURVIVE A PLAGUE -- which shows the world just how its GLBT population, particularly here on the east coast of the U.S., banded together, mostly under the auspices of Act-Up, and forced our country to confront and do something about the, yes, plague of AIDS (listen to Larry Kramer's passionate impromptu speech about just this, which is one of the highlights of the film) that suddenly began decimating the gay population at the start of the 1980s. 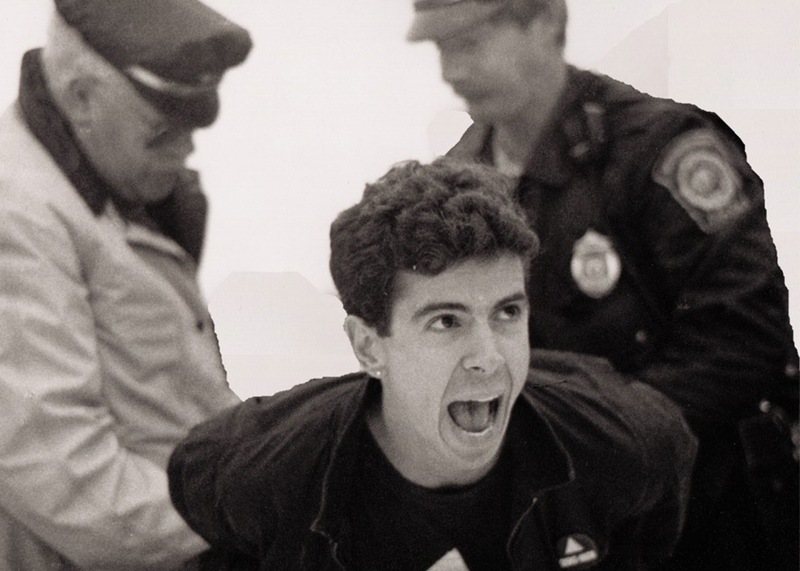 We've seen other documentaries and narrative films about this awful time -- most recently, United in Anger: A History of Act-Up -- but nothing I have seen comes close to giving us the comprehension and compassion managed by this new film, which was directed and co-written by David France (shown at left). How did Mr. France achieve this? For one thing, his doc seems more immediate, more energized than others. France's choice of footage, most of it quite old and often grainy, is nonetheless so redolent of those awful-yet-amazing years. 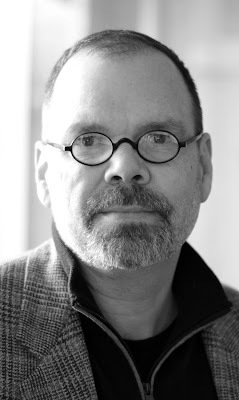 And the editing, by Todd Woody Richman and Tyler H. Walk, is so on point, carrying us swiftly and intelligently from person to place to event, as the past creeps up on the present. There are heroes aplenty in this film, especially the Act-Up demonstrators who lay down -- everywhere from St. Patrick's Cathedral in NYC to various government offices -- and were arrested for their trouble. 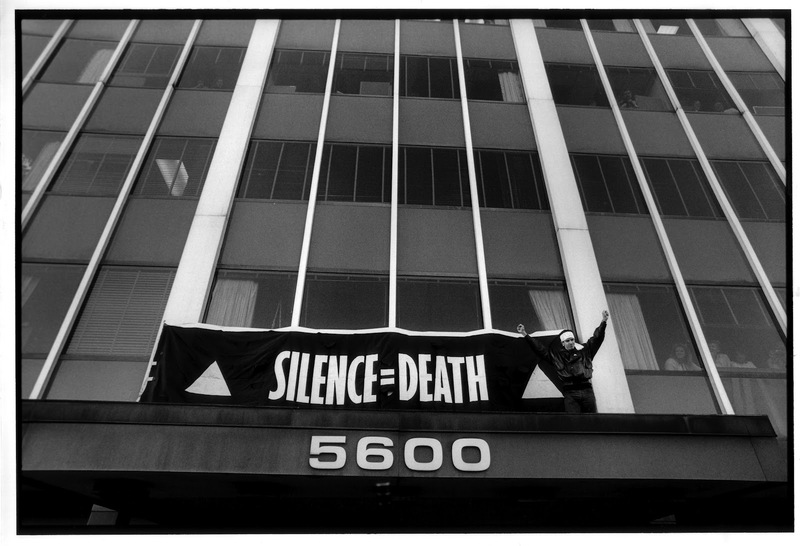 Specific heroes would have to include Peter Staley (above), a young and very closeted bond trader when the plague began, who went on to become an activist and driving force behind Act-Up; Iris Long (at left, two photos below) who was not gay but who could not stand to see the discrimination continue; Bob Rafsky, a bisexual with children; Ray Navarro, artist and activist; Mark Harrington (shown at bottom, right), who managed to finally give up smoking; and of course, Mr. Kramer (shown bottom, left). Some of these people are gone now; others remain, and one of the amazements of the film is to finally see them as they are. To hear these people speak now sounds like some of our ancient war veterans speaking about the most horrible, but yes, the greatest and most challenging time of their lives. The historic footage here is often marvelous (Mr. Staley vs. Pat Buchanan on TV's Crossfire). I learned a lot watching this movie, especially about Act-Up's very real work toward putting together the National AIDS Treatment Research Agenda and other science-based work. 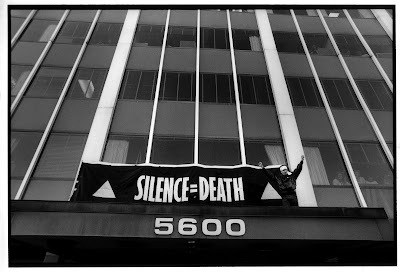 The organization was not, as some of us imagined at the time, only concerned with high-decibel activism. 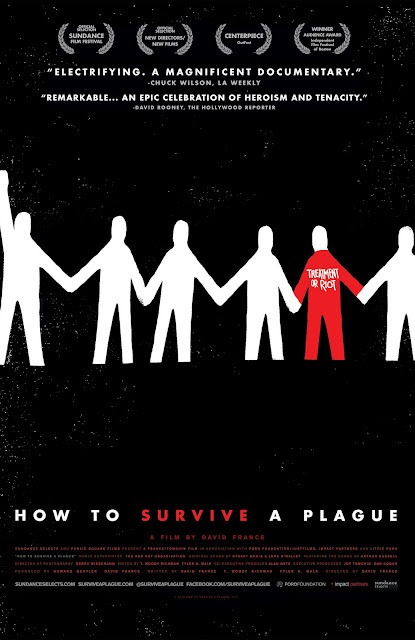 How to Survive a Plague (from Sundance Selects, 110 minutes) opens today, Friday, September 21, in New York City, Los Angeles, San Francisco and Chicago (click the city link to see the theater), and will expand across America to other major cities in the weeks to come. Click here and then scroll down to see all the currently scheduled playdates.